Maximizing the greenhouse gas reductions from biomass: The role of life cycle assessment. Biomass and Bioenergy, Volume 81, October 2015, Pages 35-43. To address the global threat presented by rising greenhouse gases and climate change, renewable bioenergy derived from biomass are a necessary part of the equation. But one of the perks of bioenergy—its potential to be used in many different ways to replace fossil fuels in generating electricity, heat, transport fuel, and more—also raises an important and challenging question: How can we get the most out of limited biomass resources? 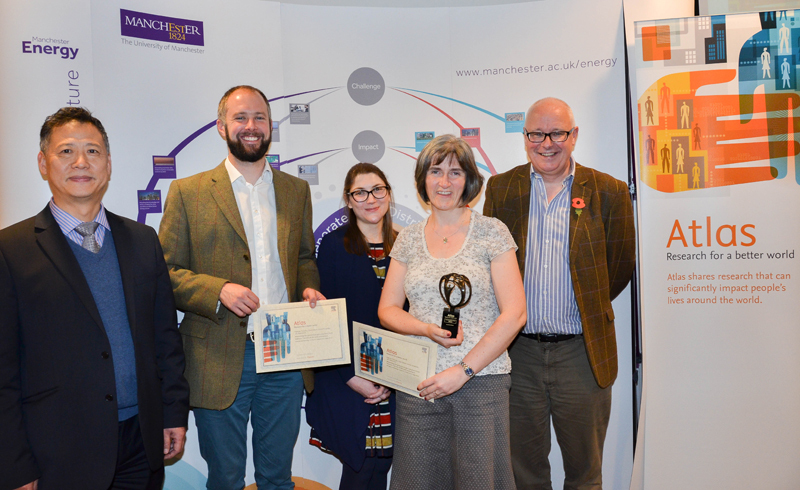 The Atlas Award-winning study led by Thornley and her colleagues and reported in the journal Biomass and Bioenergy sets out to calculate the true costs and benefits associated with replacing fossil fuels with bioenergy in various forms and for various applications. Their life cycle assessment (LCA) approach takes into account entire bioenergy systems, including every step along the supply chain. Their assessment takes all of those hidden costs into account to provide a solid foundation for making decisions about the future of energy. The results confirm that bioenergy can deliver substantial and cost-effective greenhouse gas reductions. But the best choice among bioenergy systems also depends in important ways on precisely how one asks the question. Their assessment shows that large-scale electricity systems come out on top in terms of absolute greenhouse gas reductions per unit of energy generated. However, use of wood chips in medium-scale district heating boilers wins out over electricity in terms of delivering the highest greenhouse gas reductions per unit of harvested biomass. Biochar—charcoal derived from biomass and used as a soil amendment—can deliver the most cost effective greenhouse gas reductions per unit of land area. Collaborators on the report include Paul Gilbert also from the University of Manchester’s Tyndall Centre for Climate Change Research along with Simon Shackley and Jim Hammond from the UK Biochar Research Centre at the University of Edinburgh. The research was funded by the UK Engineering and Physical Sciences Research Council as part of the SUPERGEN Bioenergy Consortium and SUPERGEN Bioenergy hub. In this podcast, we speak with Atlas award winner Patricia Thornley about bioenergy, its potential to reduce greenhouse gas emissions, and how their life cycle assessment approach can be applied in the policy arena. It’s clear there are various ways in which biomass might be put to use as an energy source with potential to reduce greenhouse gas emissions. What issues does this raise? One of the key selling features of bioenergy as a renewable energy source is that it’s incredibly flexible. You can use it in lots of different ways. Traditionally biomass has been used for hundreds of years for heating. But really what we’ve seen happening over the last 200 years is, as we’ve had the industrial revolution, we’ve had more and more fossil fuel use resulting in greenhouse gas emissions. So the key focus has been on trying to reduce those. The thing we’ve targeted most in the last 20 to 30 years is electricity. You can also use biomass for chemicals and transport fuel. It has the advantage that you can use it in lots of different ways, but that can also be in some ways a disadvantage because what’s been happening in recent times is that people have gotten a bit confused about what we should use it for. Policymakers have ended up paralyzed because every week there’s a different paper saying it’s best to do it this way or that way. How can we go about making those decisions on the best use of biomass? A key thing is to be really clear what you are looking for from the outset and what we are looking for from a bioenergy system is a significant greenhouse gas reduction. That’s one of the starting points. If we’re looking for a reduction, we’re looking to replace something. It would be better if it replaces something fairly carbon intensive in the first place. If you are looking at an industry that’s already had a long history of development, where things are running relatively well with fossil fuel, the savings that are available there will be lower. The way we framed this paper was to look at different ways of asking the question: How much greenhouse gas can we save with bioenergy? When you ask the question in different ways, you get different answers about which technology is preferred. It can depend on a host of other things that sometimes have nothing to do with the bioenergy system at all. You’ve got to be really clear what you are trying to achieve. How does this life cycle assessment approach work? To understand life cycle assessment, consider the example of a car. If you look at a car, it’s utility is to drive you from A to B—that’s what a car does. If you look at petrol consumption and emissions over that period, it’s tempting to look only at what goes into the car and what comes out. Life cycle assessment goes further than that. It’s about looking upstream to realize that the car was produced in a certain way. It took energy to manufacture and material resources. Also, critically, there’s a disposal required at the end of it. When we talk about life cycle assessment, it’s from cradle to grave. We look at all the upstream, usually invisible processes and we look downstream as well at what happens when this thing reaches the end of its life. In the case of bioenergy systems, to get a fair comparison of their net impact to the planet, you’ve got to look at production. In the case of biomass, it’s not only the infrastructure in the plant you’ve got to consider but also the biomass feedstock itself. If you have this wood at a power plant, you’ve got to consider how did it get here? Where did it come from? What were the impacts along the way? Calculating the greenhouse gas balance of biomass is incredibly complicated and controversial because there are so many ways of framing the question. There are many factors to consider. It’s something that’s incredibly complicated, but incredibly important we get it right because the last thing a policymaker wants to do is to be involved in instigating a policy instrument that incentivizes renewable energy and that actually creates more carbon emissions than it displaces on the fossil fuel side. How can your work be put to use now? The main significance of this work is in framing policy development. This is something that’s incredibly active at the moment. In the European Union there have been efforts to revisit the bioenergy policy system in recent years. At the moment, we have a system that says renewable bioenergy systems must meet minimum sustainability criteria, to achieve minimum greenhouse gas savings. People are developing greenhouse gas calculators. It’s all very well and good to have a calculator, but if you are going to do it you need to very carefully tailor the methodology of the calculator around the objective you want to achieve. In many instances now, I think that’s not the case. We really need to be very, very careful to be taking into account the impacts on a common basis. Biomass and Bioenergy is an international journal publishing original research papers and short communications, review articles and case studies on biological resources, chemical and biological processes, and biomass products for new renewable sources of energy and materials. The scope of the journal extends to the environmental, management and economic aspects of biomass and bioenergy.